What “feels like home” to you? I’m still working on calling Memphis home because even though I’ve lived here for 5 years, there’s just something natural about saying, “I’m going home to see my family” when I travel to visit them in New York. When does one get to the point in adulthood where “home” turns into “my parents’ house”? Is it just me, or is that part of growing up, and-dare I say it- adulting? I usually go “home” to visit my parents in the summer when produce is abundant. This year, I went in June and timed it right so that I got to pick strawberries in Memphis AND a month later in New York. It was awesome! But despite years of living here, I’m still not used to this “everything is in season already” thing about Memphis; berries and vegetables always seem to be here before I expect them, and sweet corn goes out of style before I realize it’s even available, but I guess that’s what the South will give ya. Anyway, going home ALWAYS involves making pie. It’s my dad’s favorite dessert, the fruit and time are available (#vaca), and happy family members will never turn down a slice. Dear Dad, some things are just meant to be messed with. Furniture, my kiddos at school ;), little kids’ hair, and pie flavors all deserve a good shake up once in awhile. Life is more fun when you try new things and experiment; just ask a scientist. If you don’t try something new, you could really be missing out and never even know it! What a sad life. (Somehow this got deep pretty quick.) All I’m trying to say is… there’s a time for tradition, and there’s a time for bucking it. This is a time for the latter because the experiment yielded some delicious results! 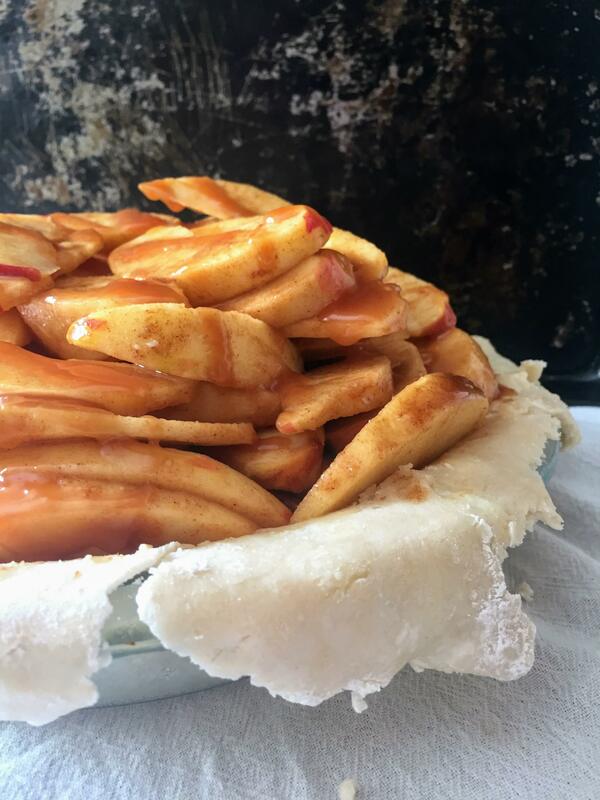 Here’s the finished product: a fat, hefty pie (the only kind of pie, in my opinion) loaded with apples, a buttery crust, and the homemade miso caramel sauce! The real wonder here is not only this pie, but also that my dog didn’t sink her teeth into it while I was photographing this on the back deck :O! Here’s a closeup of the lovely miso caramel drizzled pie. I know the finished product looks so much prettier, but I loved the drizzle shot. Gotta have that drizzle. Fat pies. Love ’em or get gone . 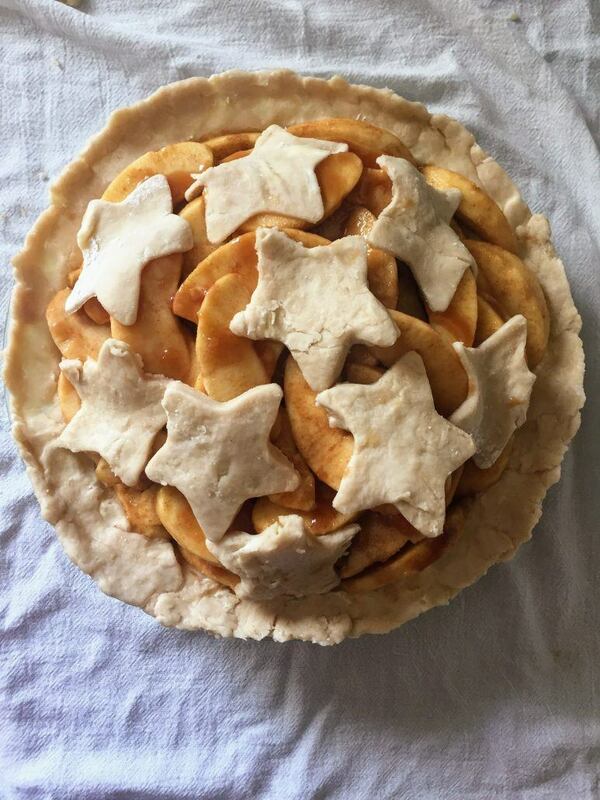 And the prebaked, star-covered pie! You don’t have to cover your pie with stars, but for me, that was a miliion times easier than rolling out the dough thin and large enough to cover this hulk of a pie. Seriously… the height is beautiful, but it has its logistical drawbacks. 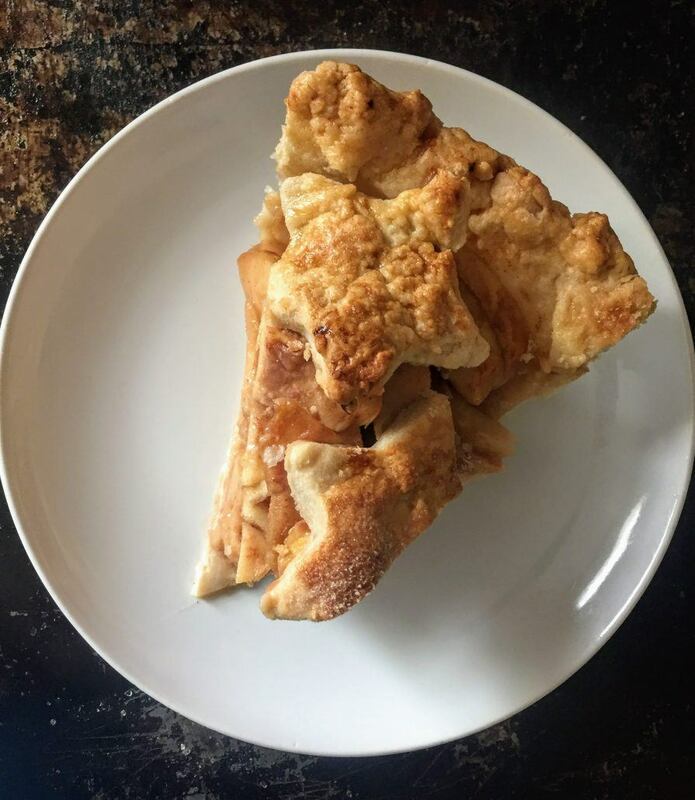 I hope you make this pie and LOVE it like I did! If you do, let me know how it goes! 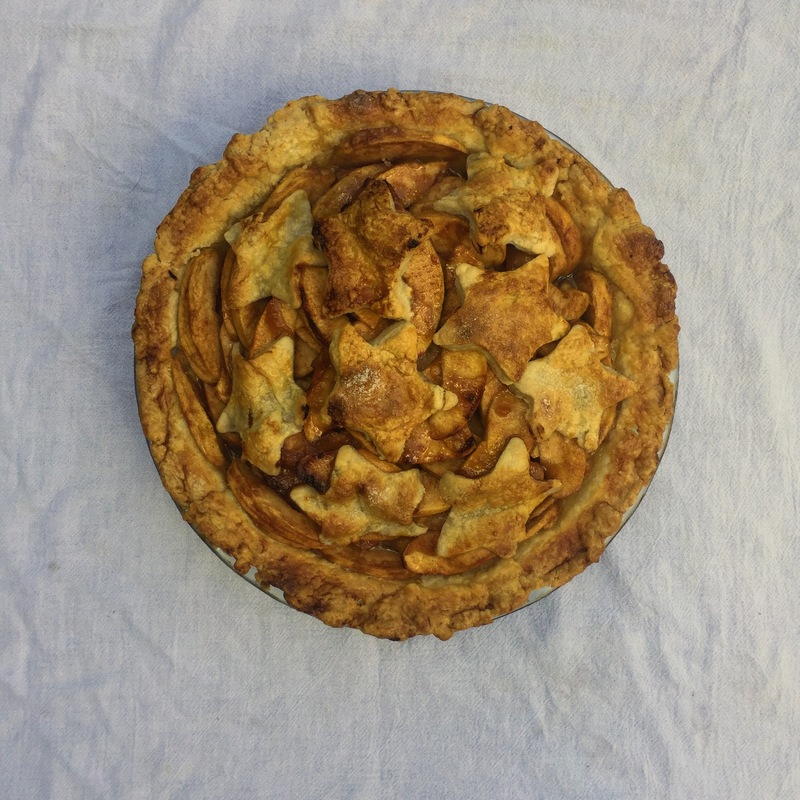 Here’s to fall, piemaking, and experimenting! A star covered apple pie with a subtle miso caramel sauce. To make the pie crust, mix flour and salt together in a bowl. Cut the butter and lard into the flour mixture using a pastry blender. Continue until the pieces of butter and lard are about the size of peas. Gradually add ice water to the crust mixture, about 2-3 tbsp at a time. Mix between each addition of water, and stop adding water once the mixture comes together in a ball. Shape the dough into two wide, semi-flattened spheres. Refrigerate for at least one hour. For the miso caramel, bring water and granulated sugar to a boil in a medium pot on medium high. Stir until combined, but not any more than you have to. My mixture took about 7-8 minutes to boil. Once the mixture boils, keep boiling it until it begins to turn a golden brown color. This took about 8 minutes, and it felt like forever. It will smell like something is burning. You can use a wet pastry brush to incorporate any sugar crystals on the side of the pan back into the mixture. When the mixture is golden brown, remove it from the heat and whisk the cream into the mixture. The caramel may seize (harden up), but I did two things to minimize this: (1) I microwaved the cream for 30 seconds before adding it to the pan and (2) put the pan back on low heat and kept whisking until the caramel was smooth and cream was incorporated. Whisk in the miso and allow to cool slightly before placing in a jar and refrigerating. When you want to use the caramel sauce, you will need to microwave it to return it to a pourable consistency. To make the filling, mix flour, cinnamon, brown sugar in a small bowl. As you peel, core, and slice the apples, place them in a large bowl. Once you\'ve prepped all of the apples, sprinkle with lemon juice and mix gently. Then pour the brown sugar mixture over the apple slices and stir until just combined. Preheat the oven to 400 degrees. Prepare a pie pan by spraying it with nonstick spray and sprinkling it with white sugar. Move the pie pan around until the entire inside of the pain is coated with sugar. Once the dough has chilled, roll one of the balls out on a floured surface until it is about 1.5 times the size of the pie plate. 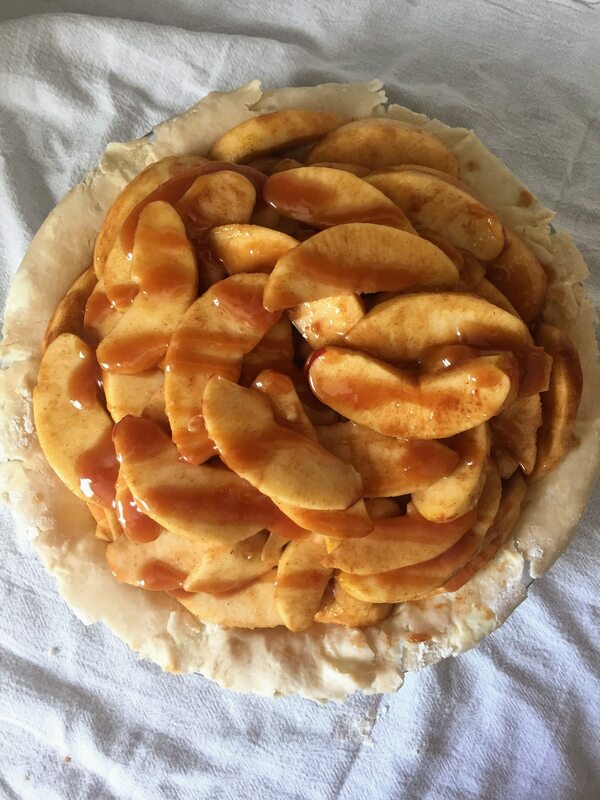 Flip the rolled dough into the pie plate and cover the bottom of the crust with 1/4 cup of the miso caramel sauce. Then spoon the filling into the pie crust. Discard the juices. Drizzle an additional 1/4 cup of the miso caramel sauce over the filling. Roll out the second disk of dough until it is about 1.5 times the size of the pie plate. To make the star cutout crust, use a star shaped cookie cutter to cut the dough into shapes. Arrange the shapes over the pie filling. If you want to make a lattice crust, use a pizza cutter or knife to cut the dough into even strips. Weave the strips over the pie filling. 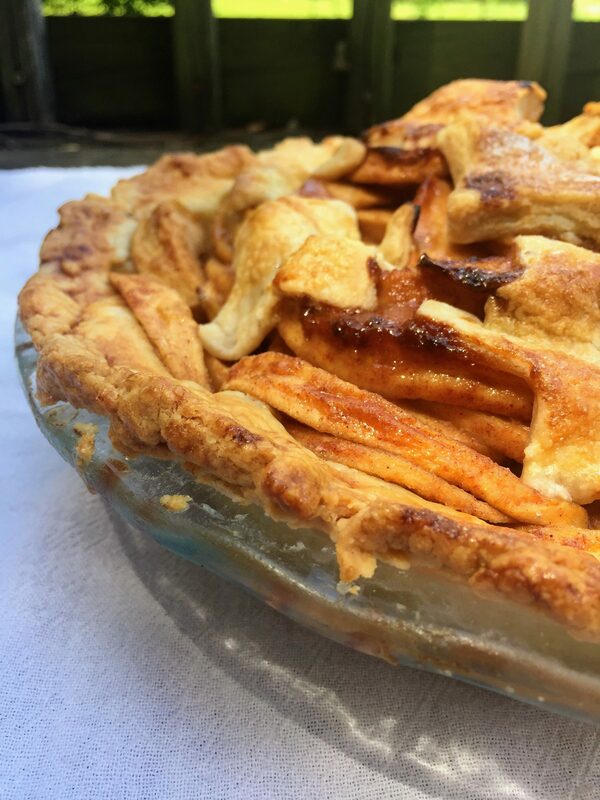 Brush the crust of the pie with egg wash (milk and egg whisked together) and place it on a large cookie sheet or pie plate. Bake the pie at 400 degrees for 20 minutes. 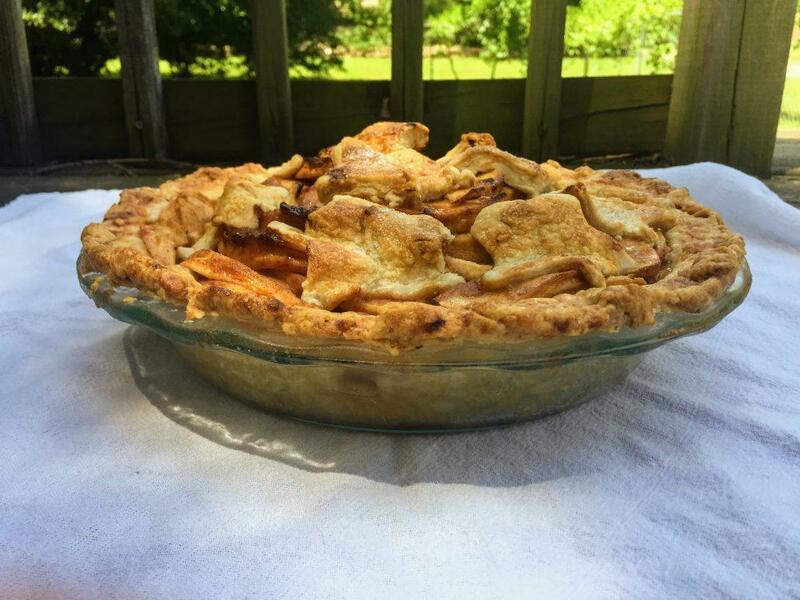 Then turn the pie and decrease the oven temperature to 375 degrees. Bake for an additional 25-35 more minutes until the crust is evenly browned and the fruit is fairly soft. I baked mine for 40 minutes total, and it could have used a few more minutes. Allow the pie to cool for a few hours before cutting.